2016-02-25: There is a Tele Vue dovetail bar made for items like the the Sol-Searcher. 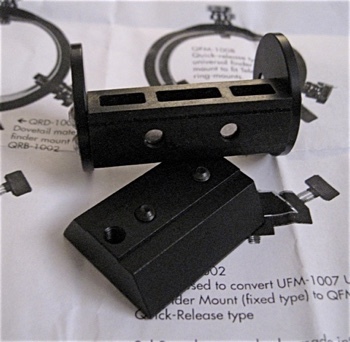 If it fits the finder scope shoe/bracket that is already on the scope I'll get one and give that a try, otherwise I have the plans drawn up for an adapter here. The Sol-Searcher may need the trough on my adapter to keep it from wandering around in azimuth when just using magnets to mount it. 2016-03-03: The Tele Vue dovetail ended up being just right. I glued two of the #10-32 3/8" set screws that I didn't use when I put together the Sol-Searcher for the Lunt, and set the height of them so they stuck out of the dovetail the same amount as the ones on the Lunt scope. There's a bit of play side-to-side using just the magnets to hold the finder on to the dovetail without the trough to set the finder in, but not enough to matter. To make sure the finder is pointing straight ahead you just have to pull the finder to one side. The dovetail fit the Sky-Watcher's bracket perfectly. 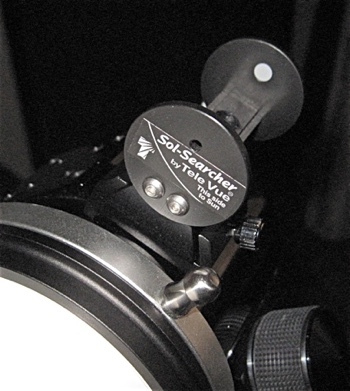 2016-03-04: Being stupid I didn't order another Sol-Searcher when I ordered the dovetail so the Sky-Watcher could have one of its very own. I thought about it, but just didn't do it. I have no doubt that someday I will grab one scope or the other and head off into the desert only to find out the Sol-Searcher is in the box for the telescope that I didn't bring. To help prevent that it's on order now, along with a few more magnets.